The first collegiate Greek-letter fraternity and the oldest honor society for the liberal arts and sciences. The Phi Beta Kappa Society (ΦΒΚ) is the oldest academic honor society in the United States, and is often described as its most prestigious honor society, due to its long history and academic selectivity. Phi Beta Kappa aims to promote and advocate excellence in the liberal arts and sciences, and to induct the most outstanding students of arts and sciences at American colleges and universities. It was founded at the College of William and Mary on December 5, 1776 as the first collegiate Greek-letter fraternity and was among the earliest collegiate fraternal societies. Phi Beta Kappa (ΦΒΚ) stands for Φιλοσοφία Βίου Κυβερνήτης (Philosophia Biou Kybernētēs), which means "Love of wisdom is the guide of life" or "Philosophy is the governor of one's life." According to Phi Beta Kappa, the organization has chapters in about 10% of American higher learning institutions, and about 10% of these schools' Arts and Sciences graduates are invited to join the society. Although most students are elected in their senior year, many colleges elect a very limited number of extremely select students in their junior year, generally less than 2% of the class. Each chapter sets its own academic standards, but all inductees must have studied the liberal arts and sciences (Bachelor of Arts (BA) degree candidates), demonstrated "good moral character", and, usually, earned grades placing them in the top tenth of their class. (However, at least one school, Princeton University, includes Bachelor of Science in Engineering (BSE) students in Phi Beta Kappa.) There is a mandatory initiation fee (between US$50 and US$90, as of 2005), which is sometimes covered by the inductee's university. Membership in Phi Beta Kappa is limited to undergraduates with very high GPAs, typically at least 3.8 or 3.9 out of a 4.0 scale. In 2001, a quorum of PBK alumni voted to raise the GPA cutoff: though all chapters set their own standards for induction, they were now instructed to be much more selective in terms of GPA. The higher cutoff was justified in reference to the historical phenomenon of grade inflation since the 1950s and 1960s. Present-day Phi Beta Kappa Memorial Hall entrance at The College of William & Mary. The Phi Beta Kappa Society was founded on December 5, 1776 at the College of William and Mary in Williamsburg, Virginia by five students, with John Heath as its first President. The society established the precedent for naming American college societies after the initial letters of a secret Greek motto. A second Latin-letter fraternity at William & Mary was the P.D.A. Society (publicly known as "Please Don't Ask"). John Heath, chief organizer of Phi Beta Kappa, according to tradition earlier sought but was refused admission to the P.D.A., though he may instead have disdained to join it (Heath's friend and fellow student William Short later wrote that the P.D.A. "had lost all reputation for letters, and was noted only for the dissipation & conviviality of its members":84). Further chapters appeared at Union College in 1817, Bowdoin College in 1825, and Brown University in 1830. The original chapter at William & Mary was re-established. In 1831, the Harvard chapter publicly disclosed the fraternity's secrets during a period of strong anti-Masonic sentiment. The first chapter established after the Phi Beta Kappa became an "open" society was that at Trinity College (Connecticut), in 1845. By 1920, a total of 89 chapters existed at a variety of schools. New chapters are continually added. In the 1960s, Vanderbilt University professor Donald Davidson claimed that Phi Beta Kappa was under the influence of Communists. In 1988, the United Chapters of Phi Beta Kappa officially changed its name to The Phi Beta Kappa Society, recalling the name under which the organization had been established in 1776. Phi Beta Kappa also funds a number of awards, fellowships, and programs. The Phi Beta Kappa Book Awards are the Ralph Waldo Emerson Award, the Christian Gauss Award, and the Phi Beta Kappa Award in Science. The Book Awards are given annually to outstanding scholarly books published in the United States. Winning works, which are drawn from the fields of the humanities, the social sciences, the natural sciences and mathematics, must be of broad interest and accessible to the general reader. Each award carries a $10,000 prize. The winners were selected from five short listed titles in each category. The Mary Isabel Sibley Fellowship is awarded annually, alternating in the fields of Greek and French. The award may be used for the study of Greek language, literature, history, or archaeology, or the study of French language or literature. Established in 1934 by Isabelle Stone (ΦΒΚ, Wellesley College) in honor of her mother, Mary Isabel Sibley, the fellowship was designed to reward the women in these two fields of study with the experience of studying and living abroad, which Miss Stone did in Greece during her studies. The fellowship carries a stipend of $20,000. The Walter J. Jensen Fellowship for French Language, Literature, and Culture aims to help educators and researchers improve education in standard French language, literature and culture and in the study of standard French in the United States. Established in 2001 by Professor Walter J. Jensen (ΦΒΚ, UCLA), the fellowship is awarded for at least six continuous months of study in France and carries a stipend originally set in 1995 at $10,000, to be adjusted for inflation. The stipend for 2016 was $15,500. The Dr. Martin R. Lebowitz and Eve Lewellis Lebowitz Prize for Philosophical Achievement and Contribution is awarded by the Phi Beta Kappa Society in conjunction with the American Philosophical Association. The associated Lebowitz Symposium is presented annually at a divisional meeting of the American Philosophical Association. The prize was established in 2013 by Eve Lewellis Lebowitz in honor of her late husband, Martin R. Lebowitz, to provide a significant, tangible recognition for excellence in philosophical thought. The Symposium program consists of a pair of lectures to be delivered at an annual APA division meeting and a Phi Beta Kappa event. The topic of the lectures should be an important philosophical issue of current interest, and the lectures should offer contrasting (not necessarily opposing) views on that topic. Honoraria for the symposiasts are funded at an adjusted rate based on the current size of the endowment. Previous winners have won as much as $25,000 each. The Romanell-Phi Beta Kappa Professorship is awarded annually to scholars in the field of philosophy, without restriction to any one school of philosophical thought. The professorship recognizes not only distinguished achievement but also the recipient’s contribution or potential contribution to public understanding of philosophy. Since 1956, the Phi Beta Kappa Visiting Scholar Program has offered undergraduates the opportunity to spend time with some of America's most distinguished scholars. The purpose of the program is to contribute to the intellectual life of the campus by making possible an exchange of ideas between the Visiting Scholars and the resident faculty and students. Phi Beta Kappa also sponsors a National Arts & Sciences Initiative, which taps into its cross-country network of members, chapters, and associations to connect with leaders, shares the value of the arts and sciences through all of life, and advocates for policies that strengthen an arts and sciences education. Phi Beta Kappa has 286 chapters. Chapters are approved at the Triennial Conventions. Since inception, 17 U.S. Presidents, 40 U.S. Supreme Court Justices, and 136 Nobel Laureates have been inducted members. ^ "Phi Beta Kappa". University of Virginia - The College of Arts & Sciences. Retrieved May 15, 2018. Phi Beta Kappa is the nation’s oldest and most prestigious undergraduate honors organization. For more than 200 years, the Society has pursued its mission of celebrating and advocating excellence in the liberal arts and sciences, and its distinctive emblem, a golden key, is widely recognized as a symbol of academic distinction. ^ "Phi Beta Kappa". Boston College - Morrissey College of Arts and Sciences. Retrieved May 15, 2018. Phi Beta Kappa is the most prestigious academic honorary society in the United States. Founded in 1776 at the College of William and Mary in Virginia, and nurtured early on at Harvard and Yale, the Society is currently established at 262 of the foremost colleges and universities in the nation. ^ Bernstein, Emily. "Phi Beta Kappa Key Being Turned Down By Many Honorees". New York Times. Retrieved May 15, 2018. The upshot is that Phi Beta Kappa, the nation's most prestigious honor society, has an image problem. ^ "About the Phi Beta Kappa Society". USC Dornsife - College of Letters, Arts, and Sciences. Retrieved May 24, 2018. The selectivity of membership, as well as the society’s rich history, is the reason that Phi Beta Kappa is considered among the most prestigious American college honor societies. ^ "Phi Beta Kappa". Honor Society. Retrieved May 15, 2018. Widely considered to be the nation's most prestigious honor society, Phi Beta Kappa aims to promote and advocate excellence in the liberal arts and sciences and to induct the most outstanding students of arts and sciences at American colleges and universities. ^ "What is Phi Beta Kappa?". Occidental College. Retrieved May 15, 2018. Phi Beta Kappa (ΦΒΚ) is the most prestigious and best known academic honor society in the United States ... Phi Beta Kappa celebrates excellence in the liberal arts and sciences by offering membership to the most outstanding arts and sciences students at the country’s leading colleges and universities. ^ Warren, John (2000). "Historical Information". Association of College Honor Societies. Retrieved 2009-03-10. ^ "About Us". Phi Beta Kappa. Retrieved 22 January 2012. ^ "Harvard". Archived from the original on 2012-03-17. ^ a b Nancy Keates (4 Nov 2005). "Phi Beta What?". The Wall Street Journal. Retrieved 7 September 2014. ^ "Graduation and Honors | Undergraduate Announcement". ua.princeton.edu. Retrieved 2018-07-03. The Phi Beta Kappa Society, founded in 1776 and the oldest of all national honorary scholastic societies, has a chapter at Princeton. Election to this chapter is based on scholastic standing and is open to candidates for the A.B. and B.S.E. degrees in their senior year. ^ Bernstein, Emily M. (1996-05-26). "Phi Beta Kappa Key Being Turned Down By Many Honorees". The New York Times. ISSN 0362-4331. Retrieved 2017-06-22. ^ Society, Phi Beta Kappa. "PBK_History". www.pbk.org. Retrieved 2017-06-22. ^ Brinkley, M. Kent Brinkley (March 1, 1999). "Freemasonry in Williamsburge: An Overview History of Williamsburg Lodge #6, A.F.& A.M. of Virginia". Williamsburg, Virginia: Acacia Lodge No. 16 A.F.&A.M. Archived from the original on July 23, 2008. ^ a b c d e f g h i Hastings, William T. (1965). Phi Beta Kappa as a Secret Society with its Relations to Freemasonry and Antimasonry Some Supplementary Documents. 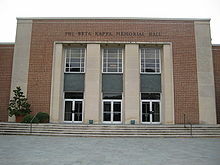 Richmond, Virginia: United Chapters of Phi Beta Kappa. ^ Fleming, Bill (May 6, 1996). "Phi Beta Kappa". Brief History of Fraternities. Sam Houston State University. Retrieved October 26, 2015. ^ Millfield, Becca (November 2, 2004). "Shhh! The Secret Side to the College's Lesser Known Societies". The DoG Street Journal. The College of William & Mary's daily online. Archived from the original on September 28, 2011. ^ "F.H.C. Society," University Archives Subject File Collection Archived January 15, 2009, at the Wayback Machine, Special Collections Research Center, Earl Gregg Swem Library, College of William and Mary. ^ a b Robert W. Storm, "In Token of Friendship: Early Fraternity Medals at the College of William and Mary"; 1973; typescript in university archives, Earl Gregg Swem Library, College of William and Mary, Williamsburg, Virginia. ^ Alfred L. Brophy, The Rule of Law in College Literary Addresses: The Case of William Greene, Cumberland Law Review Archived March 29, 2016, at the Wayback Machine (2001) 32: 231–85. ^ Houston, Benjamin (2011). "Donald Davidson and the Segregationist Intellect". In Tendrich Frank, Lisa; Daniel, Kilbride (eds.). Southern Character: Essays in Honor of Bertram Wyatt-Brown. Gainesville, Florida: University Press of Florida. p. 177. ISBN 9780813036908. OCLC 949154540. ^ "The Key Reporter - Welcome!". www.keyreporter.org. ^ "Phi Beta Kappa". Stanford University. Stanford. Retrieved 15 May 2017. ^ "Book Awards". The Phi Beta Kappa Society. The PBK Society. Retrieved 15 May 2017. ^ Society, Phi Beta Kappa. "Book Awards 2016 Winners". www.pbk.org. ^ Society, Phi Beta Kappa. "Sibley Fellowship". www.pbk.org. ^ Society, Phi Beta Kappa. "Jensen Fellowship". www.pbk.org. ^ Society, Phi Beta Kappa. "The Lebowitz Prizes". www.pbk.org. ^ Society, Phi Beta Kappa. "Romanell Professorship". www.pbk.org. ^ Society, Phi Beta Kappa. "Visiting Scholars". www.pbk.org. ^ Society, Phi Beta Kappa. "National Arts and Sciences Initiative". www.pbk.org. ^ Society, Phi Beta Kappa. "About ΦΒΚ". www.pbk.org. ^ Phi Beta Kappa Society :: Phi Beta Kappa Society Archived January 13, 2015, at the Wayback Machine. Pbk.org (2012-10-05). Retrieved on 2013-08-27. ^ "Arts & Sciences Advocacy Award – Council of Colleges of Arts and Sciences". www.ccas.net. Retrieved 2016-05-02. "Phi Beta Kappa" . The New Student's Reference Work . 1914. This page was last edited on 30 March 2019, at 02:56 (UTC).